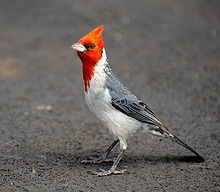 The red-crested cardinal (Paroaria coronata) is a songbird with a prominent red head and crest. This species belongs in the family of the tanagers (Thraupidae). Notwithstanding its similar name, this bird is not closely related to the true cardinal family (Cardinalidae). It is found in northern Argentina, Bolivia, Paraguay, Uruguay, Brazil's Rio Grande do Sul and the Pantanal. Its natural habitats are subtropical or tropical dry shrubland and heavily degraded former forest. Among other regions, it is found in southern part of the Pantanal. It has also been introduced to Hawaii and Puerto Rico. In Brazil, it has been introduced to various places outside its historical range, as in the Tietê Ecological Park in São Paulo, alongside its very similar-looking close relative, the red-cowled cardinal (P. dominicana). ^ BirdLife International (2012). "Paroaria coronata". IUCN Red List of Threatened Species. Version 2013.2. International Union for Conservation of Nature. Retrieved 26 November 2013. ^ Schulenberg, T.S. (2010). "Red-crested Cardinal (Paroaria coronata), Neotropical Birds Online". Cornell Lab of Ornithology; retrieved from Neotropical Birds Online:. Ithaca, NY. Wikimedia Commons has media related to Paroaria coronata.